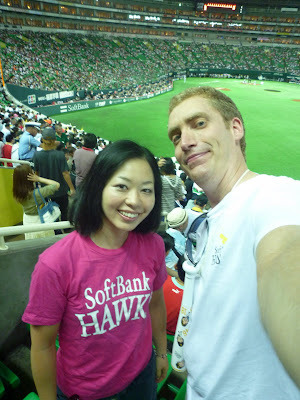 Ena and I finally went to our first Hawks game of the 2010 season yesterday. We've been meaning to go for a long time but a million little things ended up interfering with our plans until yesterday. 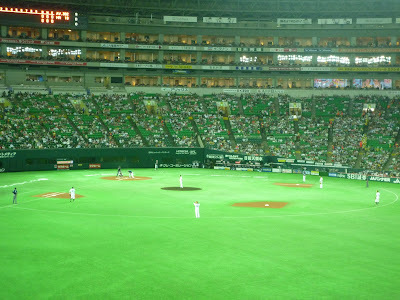 The game was played at the Fukuoka Dome. As indicated in the above picture the Dome is now actually called the "Yahoo Dome" after its corporate sponsor. When it was built it was called the Fukuoka Dome though and a lot of the street signs bus stops, etc in town still call it that. I guess it would be expensive to change all of those things every time they got a new sponsor for the stadium. It kind of annoys me the way they keep changing stadium names (what do they call the Skydome in Toronto these days?) 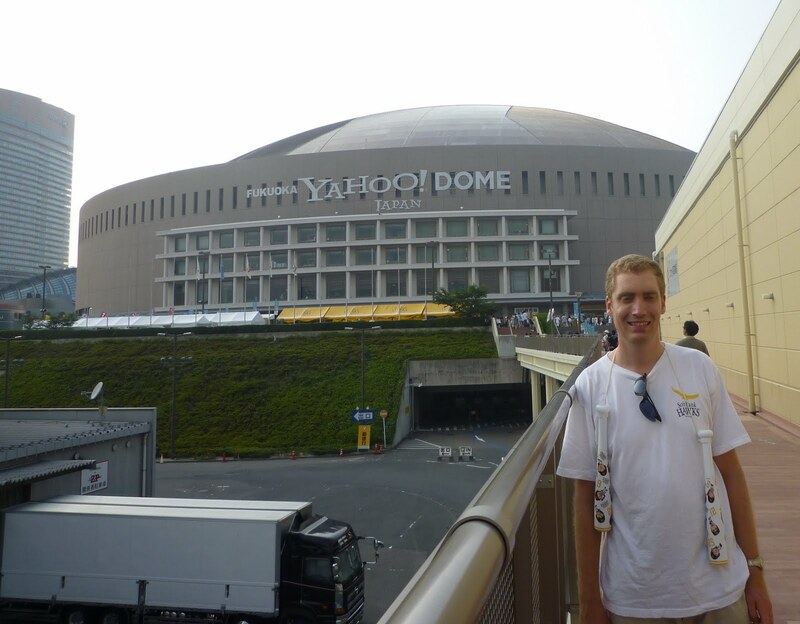 so I call it the Fukuoka Dome. 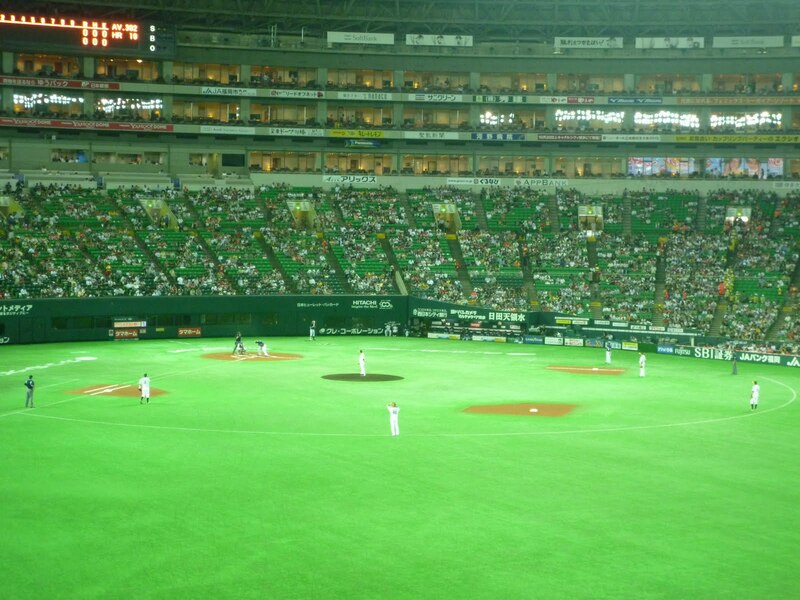 The reason I say the right field bleacher seats are the best in the house is because that is wear the Hawks Ouendan (応援団） or "Fan's association" organize all the cheering. 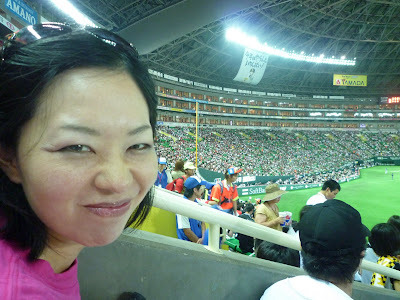 In the rest of the stadium you can basically just sit and watch the game, cheering whenever you want. In right field though you HAVE to take part in the organized cheering. During the bottom half of every inning everyone stands up and, using plastic bats like the ones that I have draped around my neck in the top photo above, follows the instruction of a lead booster who tells us which cheers we have to do. This goes on non-stop while the Hawks are at the plate and every player has a different cheer, which requires you to wave and bang those plastic bats in a different way while singing at the player to get a hit. You'll notice that he pans the camera across the audience and you see what looks like a pretty normal crowd in the bleachers on the first base side. Then all of a sudden BAM - the camera reaches the right field bleachers and suddenly there are huge flags being waved, everyone is standing and waving their bats in unison, the boosters can be seen standing above the crowd wearing their personally tailored-outfits (kind of a cross between shinto priest robes, construction worker garb and urban motorbike gang-member style) and everyone is singing. That goes on for the whole game when the Hawks are batting. It takes a while to figure out all the cheers but by about the 5th or 6th inning we had them all down (you just watch what everyone else is doing). During the visitor's time at the plate you can just sit and watch the game. That is because its the visitor's team's turn to do their own organized cheering. There is a small section in the left field bleachers reserved for them. 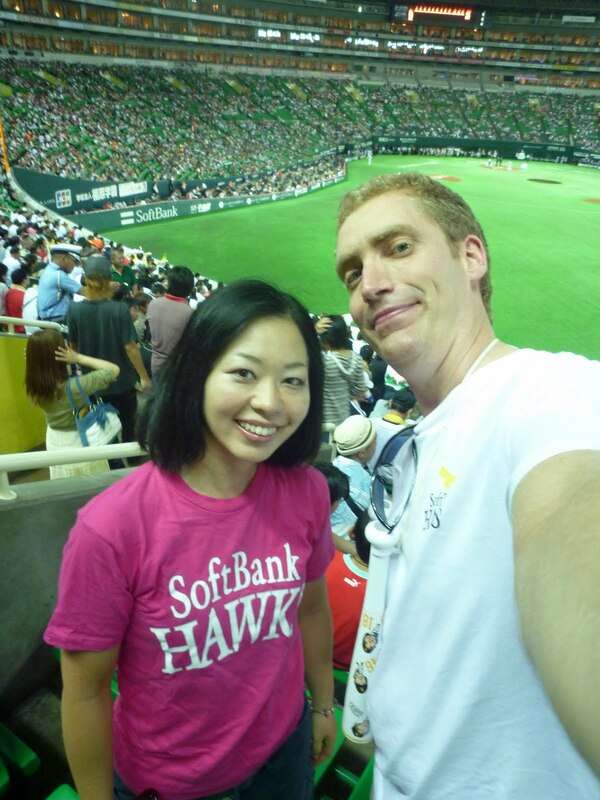 Interestingly people who sit there are contractually obliged to refrain from rooting for the Hawks or wearing any Hawks goods (this is a condition set out in writing on the ticket information form I got when we bought our tickets). 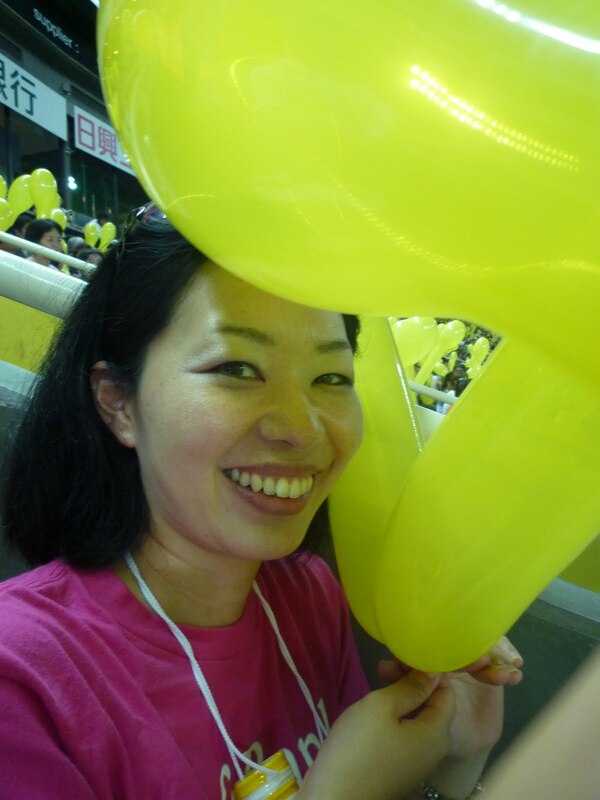 This division of cheering time is by agreement so the two side's cheering doesn't drown each other out. The only time Hawks fans can engage in organized cheering during the visitor's frame is when there is a pitching change. Then they can give one brief cheer to support the incoming pitcher and then they have to give the floor back to the visitor's rooters. Anyway, the game was a tense one. The Hawks are doing really well this year and are in the middle of a tight pennant race. 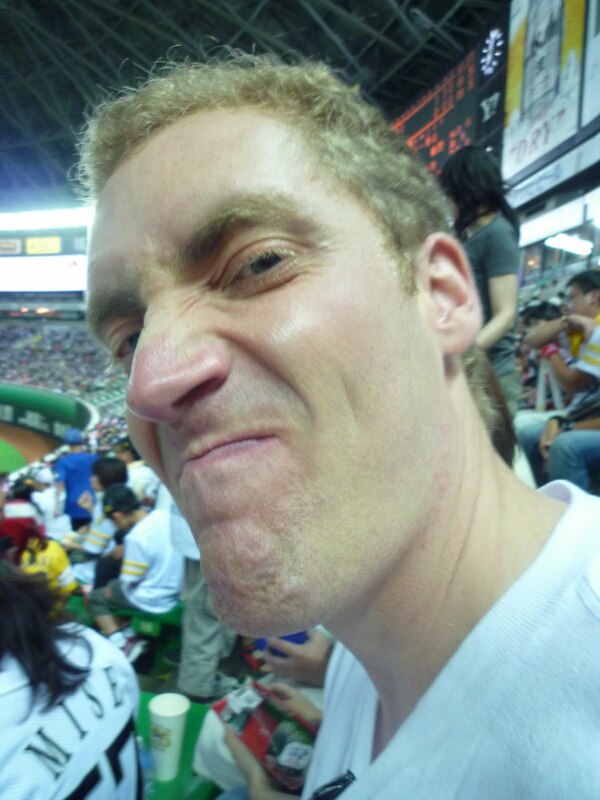 They were playing Orix Buffaloes. It was a sell-out crowd (we just barely got tickets). In the 5th though the Hawks staged a major rally and scored 5 runs, all with 2 outs. The right field bleachers were going nuts the whole time, it was great. They loaded the bases twice and each time got a 2-run hit by the batter. The Hawks took the lead 5-1 and looked like they might cruise to an easy victory. Way to rain on our parade, Alex Cabrera. After that, each team added a run each and the game entered extra innings tied at 6. Neither team scored in the 10th or 11th (despite all our cheering) and the Buffaloes got shut down in the top of the 12th. In the bottom of the 12th fan favorite Shibahara was brought in to pinch hit. And he got a base hit! Right field went wild. A pinch runner came in and the next batter laid down a successful sacrifice bunt to move him into scoring position with 2 out. 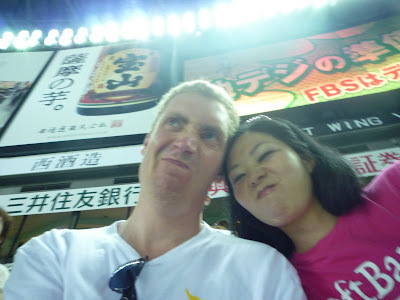 Tension filled the air and we in right field were cheering with every ounce of energy! 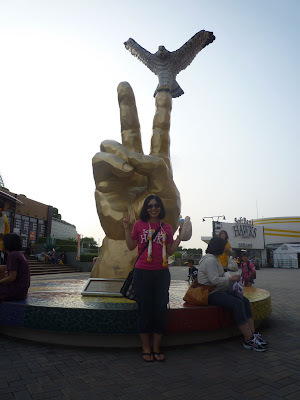 Get a hit! Drive that runner in!! Win the game! And then the pitcher picked the runner off second to end the inning. And the game! Japanese pro baseball games go to a maximum of 12 innings. If they don't resolve it by then, it ends in a tie. Argh! We went through over 5 hours of intense cheering to have it end in a tie? What an anti-climax!!! Despite our disappointment with the outcome, we had a really great time at the game. Now that we've memorized all the cheers we're planning on going again at least one more time this season! Skydome is now called the Rogers Centre. Ah Rogers Centre, LOL, thanks! Screw it though, I'm going to still call it Skydome.